Thread: Stock Pipe with Catalyst removed OR Header pipe from Vance & Hines or other Mfg. Went with the HD ceramic coated heat shields because the chrome did not match up with the Black exhaust pipes IMO. I am not really into the whole black it out thing ,but a little black here and there worked on the red IMO. The ceramic might look better. But it really has no added benefit and cost more. 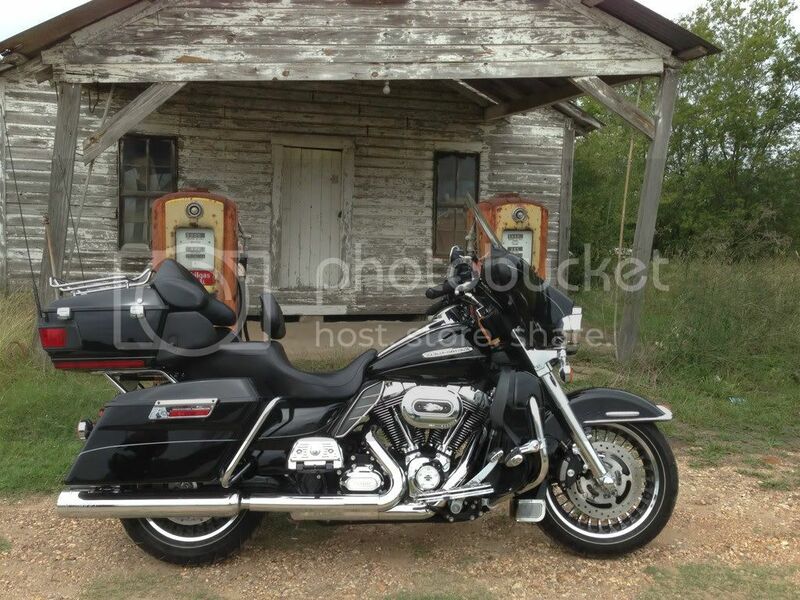 The bike in my picture has the stainless steel Jackpot header pipe with the stock heat shields on it. Got WB sensor in the 18mm holes for a Thunder-max. And I have the 12mm lambda sensors in the 12mm holes for the stock ecm and the Power Vision. Would of liked to buy some jackpot mufflers, But they are not as quiet as my 09 model supertrapp stouts. I'm tired of my head hurting , no matter if just the mufflers produced 50 extra Hp. I want a quieter buke. Not so...I would have let this go by...but this guy is wanting to gather information before he spends his money. Ceramic insulates the pipe and sends more heat out the tail pipe. A good ceramic coating can reduce pipe temps by as much as 300 degrees. Will they still burn you if you touch them?...Yes! However, I do feel they make a difference in felt engine heat. I know smitty has ceramic pipes too. I'd invite his opinion here. Furthermore, it isn't a big price adder to the cost of the pipes. I bought my Rush 2into1 ceramic coated pipes with a Rush muffler and changeable baffle at J and P cycles for $500. They are not stainless, but that is still pretty reasonable. Of course I originally wanted a stainless steel pipe set Fuel Moto makes, but it wasn't in the budget. Other things went into the project like Fueling cam plate and oil pump...so it bugs me and I will end up (one day) going back for the Fuel Moto pipes. Anyway, ceramic is used in industry for (among other things) it's insulating/heat shielding properties. It does the same for pipes...as well as shielding them from moisture. The moisture shielding is even important to stainless steel pipes. Contrary to what many people think, 304 stainless (which is what pipes are made from) will rust. ...Got WB sensor in the 18mm holes for a Thunder-max. Huh??? Do you mean to tell me you run both a thundermax and a Power Vision at the same time??? I didn't know that was possible. What is the advantage that gives you? Are you saying you got 50HP from mufflers??? Only going by what Fuelmoto told me. And the new upgraded Harley cam plates and upgrades oil pump. Don't see why there is a reason to spend the extra money on the fueling stuff. Back to gutting stock headers. As I said before it words. I ran the 2011 RGU that way 33,000 miles ran fine up until I totaled it. Cost me 60 dollars, Cut the trap door with a small grinder wheel, scraped out the CAT real good then had a local shop TIG weld it shut. If you go this route be very careful removing the 02 Sensors. Unplug them before you screw them out. Long as the bike does not have a lot of miles on it you will not need to replace the exhaust port gaskets. The gasket for the cross over may need to be replaced. I recommend you have an expander to open up the cross over a bit or it is a real pain to get the pipe back in with the gasket. While you have it off replace the hose clamps that hold Heat shields on with ones that are all SS. If you are going to also change the pipe then you will want to consider adding some fuel. Hope I don't make this too long. Didn't mean to throw a curve. I bought the Fuemoto stainless jackpot header pipe. Put the 12mm lambda sensors in it. And put the 18mm bung plugs in the top holes. Ran it with the 09 model supertrapp stout mufflers. And had the stock air breather on. Then I got the Thunder-Max and install the Wide Band 02 sensors bungs where the 18mm holes are and installed the TM. Then got a SE High flow air filter off a 2010 SE SG. Thunder-Max has done a great job for 3 1/2 yrs. Then I did the 107 Kit. Got a Buddy that I turned onto the TM 3 yrs ago. He went to a car wash and his bike wouldn't crank. So you ask yourself, Now I got to get help to get the bike home. And he is in Washington for 2 yrs with the military. He sent the TM to Thunder-Heart. They repaired it and he put it back in and was riding it for a couple weeks. Said it blew a diode. Got vacation time and was headed to Florida to meet some friends. The TM went out again. I heard about somebody else having the same thing happen. I'm on my 2nd Thunder-Max. Had one on a 07 Bike that was built and it was a cable drive. and got one on my 11 limited that is a TBW. Deceided that with the 107 I can't use the Stock ecm if something happens. So I got a Power Vision and installed it and got it to running. I can have my Thunder-Max in and run it. All I got to do is pull the left saddle bag. Take the ECM fuse out. Take the seat off. Remove the TM and put the Stock ecm in. Plus the fuse back in . Put the seat on and the saddle bag back on. I have changed computers that fast. Got the 18mm WB sensors in the top bung holes. And got the 12mm sensors in the bottom 12mm holes for the stock ECM that the PV works on. You can only use one tuner at a time. But with the Fuelmoto header pipe. I can run 2 sets of sensors. So it makes it easy to use one of the other tuner. If I ever break down I got a backup. Give me a break for the long story ..
Oh and on the mufflers. If a louder muffler could give me 50 more HP. I wouldn't want it. The loud noise hurts my head. The 09 model Super trap stout is a quieter muffler. Sorry I don't explain myself very good. ten dollar 1 inch x 16 inch paddle drill bit will get rid of your cat and get rid of some heat too! you can always buy full pipes for it if you like later. There is no way on earth you can drill the CAT totally out from the end. Can't be done. You may think it is out but cut it open and look. Plus that CAT is one tough item. It takes some man power to chip and scrape it out. it's tough but can be done and it's completely clean afterwords. i've done it to six bikes now and you can check your work with a dental mirror. clean as can be. the drill bit is shot when your done,and i used a pry bar to scrape the inside. i always make sure it's competely clean before reinstalling the pipes. there is one tough spot and that's right where the pipe turns down going towards the left. take your time and you can get it clean. somewhere on another forum someone use a bore scope to prove you can get it clean. I've heard the sensors can get cross talk when you take the catalyst converters out of the stock pipes.